Made from two simple rectangles, this summer crochet top will take you effortlessly from music festival to BBQ to beach vaca this season. Get the free pattern below or purchase the ad-free, printable PDF with stitch chart for $2.75 here. 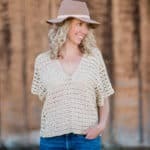 This free summer crochet top pattern is part of a collaboration with my friends at Lion Brand Yarns. This post contains affiliate links. 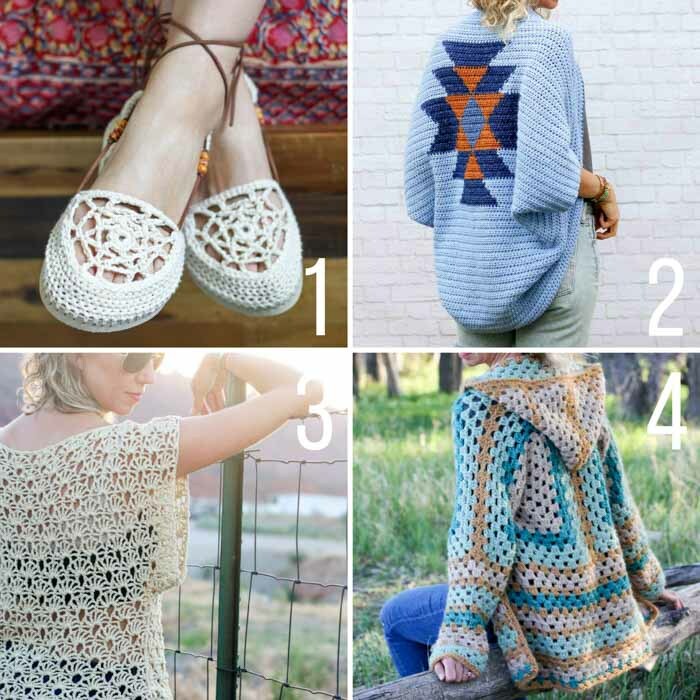 Below are a few of my favorite free spring and summer crochet patterns from last year. Do they convince you that there’s some pretty good stitches to be had from now till Halloween? Great! You can find all my warm-weather patterns here. 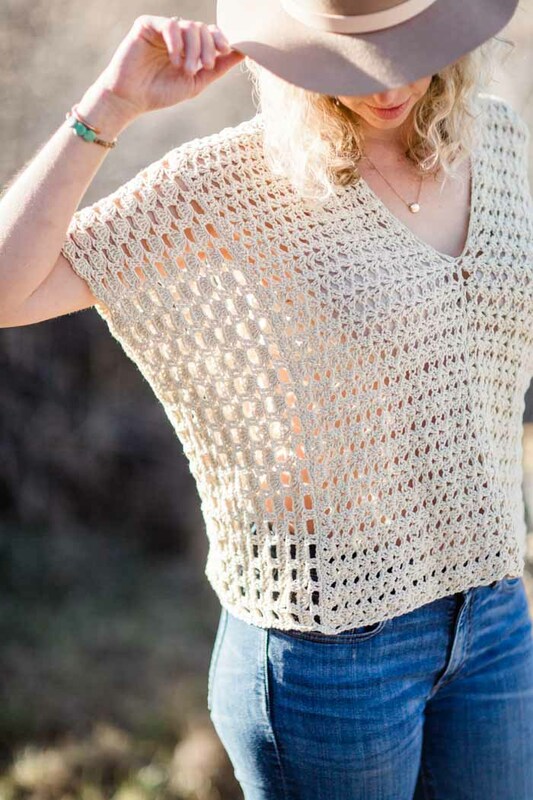 Today, I’m excited to show you a summer crochet top my mom and I designed together using one of my favorite lightweight summery yarns, LB Collection Cotton Bamboo from Lion Brand. 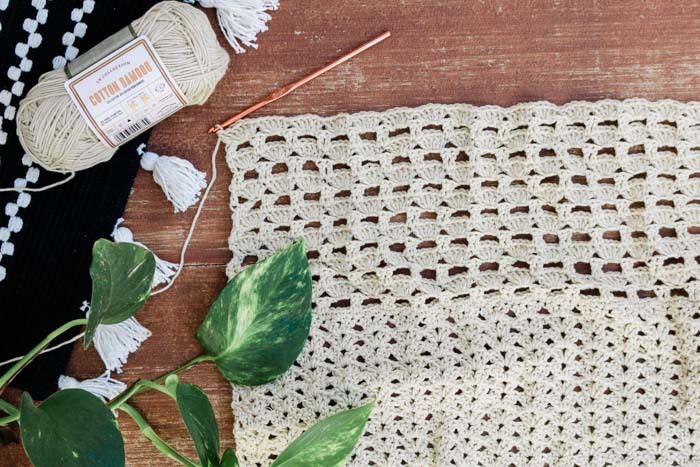 As it sounds, this yarn is a super supple mix of cotton and bamboo, which lends a beautiful floppy drape to this boho poncho shirt pattern. It’s actually the exact same yarn I used in the Canyonlands Boho Top last summer. The first time I wore the Canyonlands Top, my husband remarked that it made me look “rich.” Ha. I think that was totally a commentary on this luxurious yarn! 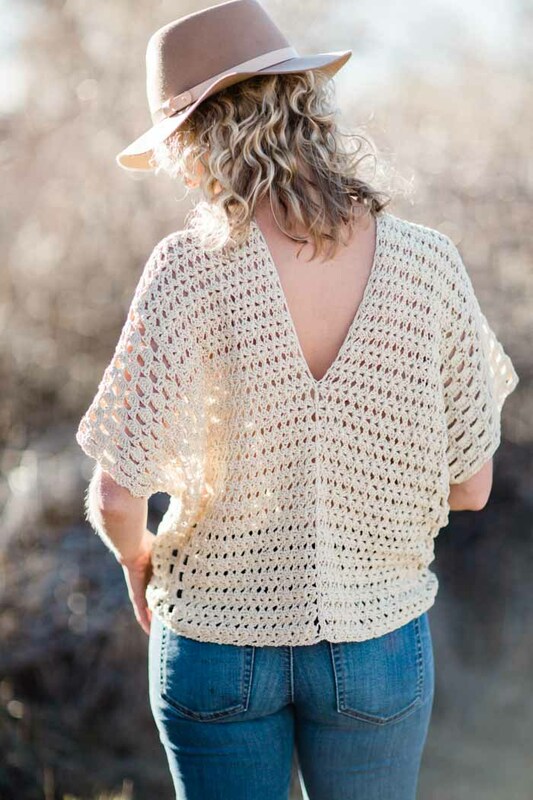 The Saratoga Poncho Top is constructed from two rectangles, making this about the easiest summer crochet top you could put together. 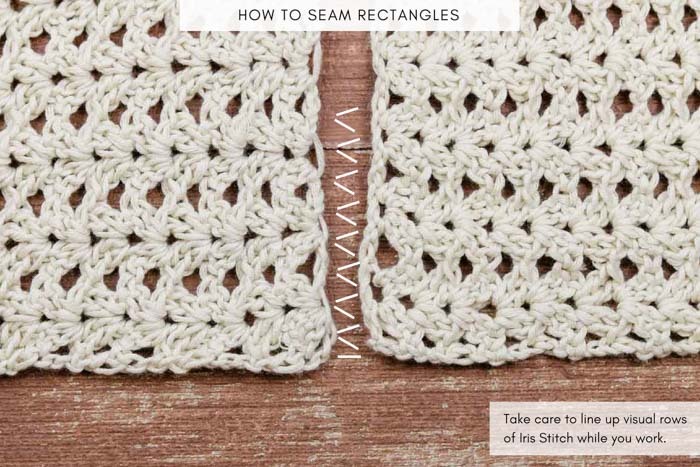 And while the lace stitches might look a little fancy, I promise you that they’re just interesting enough to keep you engaged, but definitely not too complex to do while you’re watching TV. If you’re a visual learner like me, you might really benefit from the stitch chart I’ve included in the ad-free, printable PDF. Sometimes pattern language can sound complex, but a stitch chart can reveal how easy a concept really is. You can pick up the printable PDF for $2.99 here. (It’s great for mobile viewing too.) Scroll down for the full free pattern below! I’ve also been thinking about putting together a video tutorial for this simple summer crochet top. If that’s something you’d be interested in, please leave a comment and let me know! 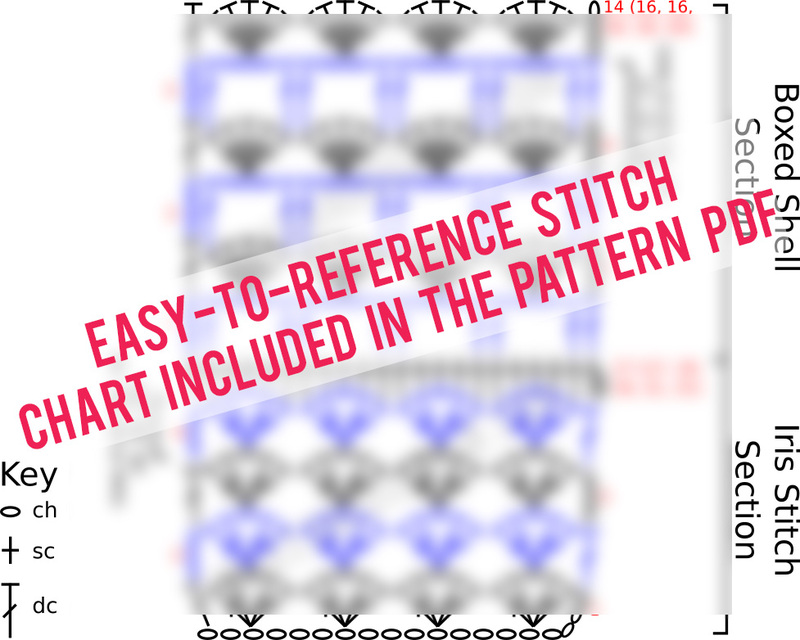 Purchase the ad-free printable PDF with stitch charts for $2.75 here. Add it to your Ravelry favorites and queue here. Whether your summer plans include a music festival, a cruise or a backyard BBQ, the Saratoga Poncho Top will give you an effortless chic piece to toss on for the next adventure. 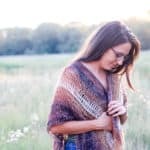 The construction of this easy poncho-style top couldn’t be simpler, but the changing stitch patterns will keep you engaged the whole way through. 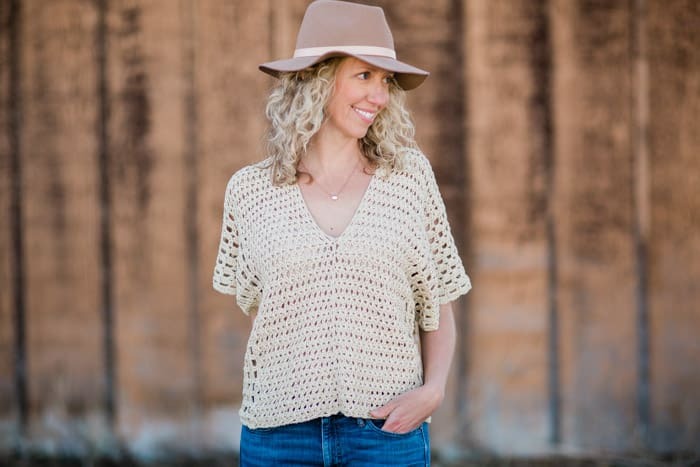 The LB Collection Cotton Bamboo yarn gives this lacy top a perfect warm-weather texture and flattering drape. See “Notes” below on choosing a size. • Pattern is worked in two identical rectangles and then seamed. • Tweaking the sizing of this top is very simple. Choose your size based on bust measurements as this will impact the number of rows you work. Then add or remove chains from the foundation chain in multiples of 4 to adjust the length of the shirt. • Ch 3 at beginning of row counts as a dc. See stitch chart in printable ad-free PDF for detailed visual explanation of stitches. Foundation: Ch 175 (179, 183, 187, 191, 195). Rows 2-16 (16, 18, 18, 20, 20): Ch 3, sk first 3 dc, *[2 dc, ch 1, 2 dc] in ch1sp, sk next 4 dc; rep from * until 2 dc remain, sk last 2 dc, 1 dc in tch; turn. Row 2 (RS): Ch 3, sk first st, *5 dc in second ch of next ch-3 arch; rep from * ending with 1 dc in tch; turn. Row 3 (WS): Ch 3, sk first dc, *1 dc in first of 5 dc, ch 3, sk 3 dc, 1 dc in last of 5 dc, rep from * ending with 1 dc in tch. Rows 4-13 (15, 15, 17, 17, 19): Rep Rows 2 and 3 5 (6, 6, 7, 7, 8) more times each. Row 14 (16, 16, 18, 18, 20) (RS): Rep Row 2. Lay both rectangles out next to each other, WS facing up, with chain edges touching. Use safety pins or stitch markers to lightly pin rectangles together taking care to line up each cluster of iris stitches. Measuring from bottom front edge of shirt, place marker at 12” (12.5, 12.75, 13.25, 13.5, 14). Repeat from bottom of back of shirt so that there is approximately a 19” (19, 19.5, 19.5, 20, 20) space between markers. Working from the bottom front edge of the shirt up, seam rectangles together using a zig zag seam. (Think of how you’d lace shoes: Insert needle in from under fabric and pull through to top, repeat on opposite piece of fabric. See photo below.) Stop at maker and fasten off. Repeat with second seam on back side of shirt. With RS facing in, pin side seam so that shells align. Place marker 10” from bottom of shirt. Working from the bottom edge up, use the mattress stitch to seam until marker. 11.5 (12, 12.5, 13, 13.5, 14)” remains unseamed for arm openings. Fasten off. Repeat with side seam on second side. 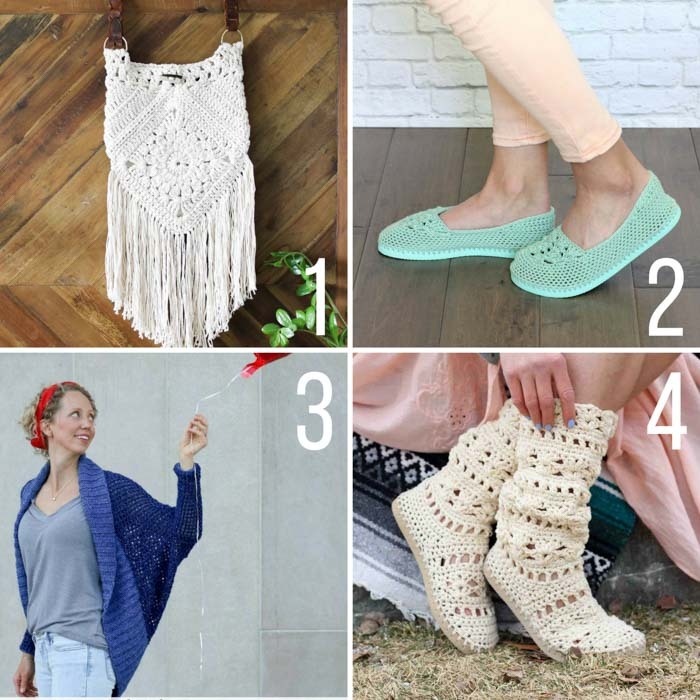 Pop on your new lace poncho shirt, stash a flower behind your ear and frolic through the rest of summer! I love to see your finished projects. Tag me (@makeanddocrew) on Instagram and use #makeanddocrew to show off your stitches! I’d love a video, too! This top is beautiful. I have some Jeans yarn that I’m dying to use…do you think that would work? It’s a cat. 4 but I feel like it’s on the lighter side but haven’t seen the cotton bamboo in person. Also, my G hook says 4.25mm. Does G come in more than one size? Can’t wait for the video. It will be so helpful. 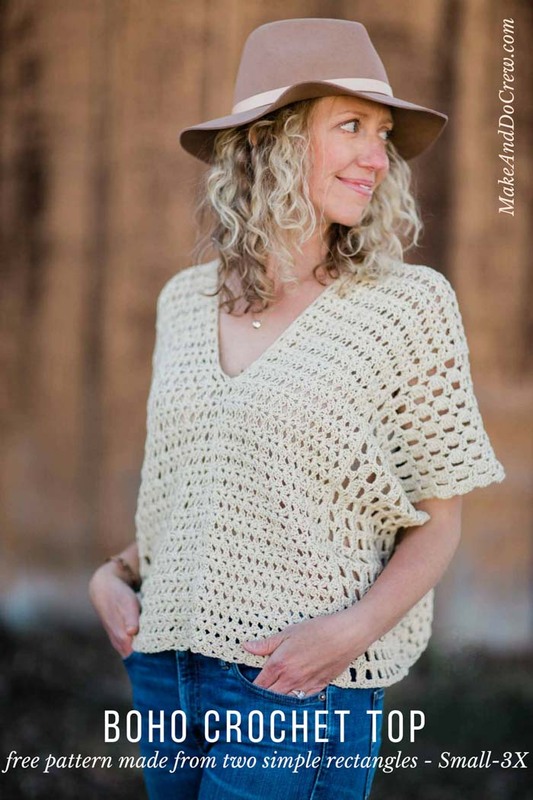 Love this top – sending it to my crochet group and I’ve pinned it also! A video would be very helpful. Thank you. Vou publicar no meu blog e colocar crédito do seu blog. Vou fazer e publicar no blog. I wonder if there is an easy way to modify the neckline – more scooped or rounded (or even boatneck), since I don’t like v-necklines on me. I may just try to figure it out, but tips would be welcomed! Yes please video tutorial! Love your patterns, can’t wait to try this and the Campfire Cardi for next fall. Is there another yarn that you could recommend that is similar to this brand? It is not available to me in my area and will cost a lot to ship 😒. Love the pattern! Yes I would love a video of this top. Also to you have a pattern for the cold shoulder top. Thanks you so much for sharing. 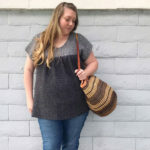 I really want to make this poncho top. Yes, A video would lbe helpful. Hi Francis. All of the patterns are free, with the option to purchase the inexpensive, ad-free PDF version. 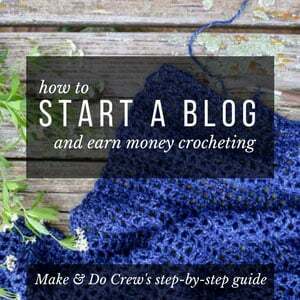 However, everyone has access to the free patterns on the blog posts. Hope that helps. I noted that you said you would be making a tutorial of this cute top approximately one year ago. I have searched and I cannot find it. Would you mind to share the link?